February 2017 – Ts’elxwéyeqw Tribe Management Ltd. 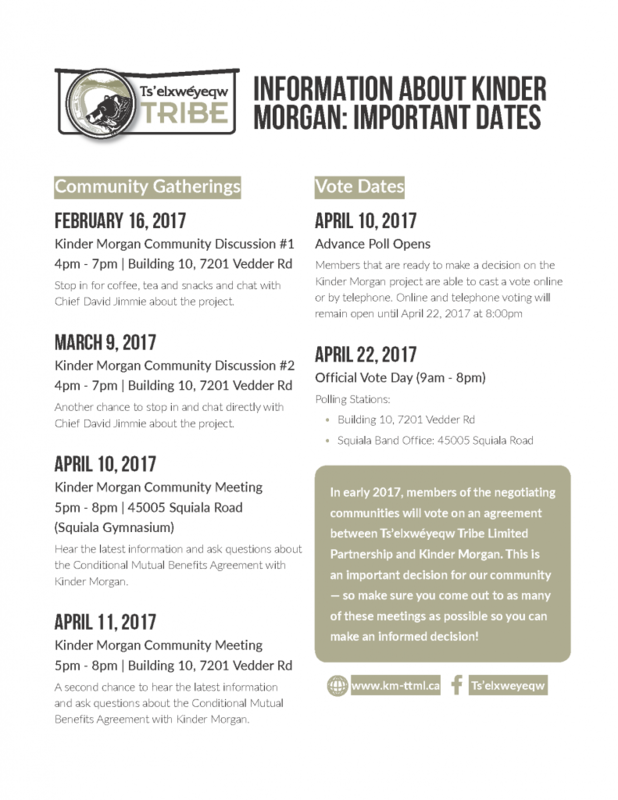 Still have questions about the Conditional Mutual Benefits Agreement with Kinder Morgan before the vote on April 22nd? Over the next few months, Community Liaisons will be visiting homes to deliver information on the project and collect contact information. In February and March, Community discussions will be held where members can stop in and chat with Chief David Jimmie about the project. In April, two Community Meetings will be held so members can hear the latest information about the agreement prior to the vote. There will be several more events leading up to the Official Vote Day to get more information: please take a look at our calendar of events Here. In early 2017, members of the negotiating communities will vote on an agreement between Ts’elxwéyeqw Tribe Limited Partnership and Kinder Morgan. This is an important decision for our community — so make sure you come out to as many of these meetings as possible so you can make an informed decision!